I love drawing animals with pencil but wanted some guidance so I bought a copy of Lucy Swinburne’s book Drawing Masterclass Animals. Although it set me on the right path it didn’t answer all the queries I had. 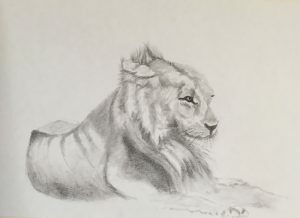 Quite by chance I discovered my favourite graphite artist, Jamie Boots was offering workshops using Caran D’Ache graphite pencils. I have done a number of Jamie’s wonderful workshops perfecting my skills and learning some of the tricks that he uses to create his stunning paintings. I have also adapted some of his techniques with my pastel paintings to great effect. I like to use Fabriano Hot Pressed Watercolour paper for my graphite drawings as it is a heavy weight paper that can withstand engraving with a 9H pencil. 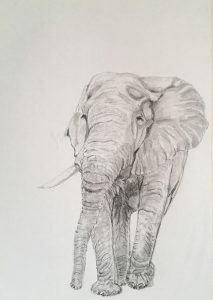 With Jamie’s expert tuition I can confidently depict the wildlife I love in graphite as a standalone drawing. 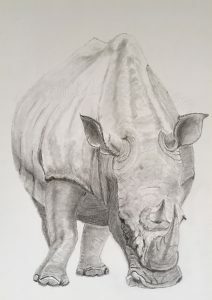 To this end I have submitted 3 drawings to the Sketch for Survival Silent Auction that runs from July to October in association with the event Explorers Against Extinction at The Royal Geographic Society in London.